President of the Movement for the Survival of the Ogoni People (MOSOP) Fegalo Nsuke says the plan to deploy the military to Ogoniland may be to have them on ground ahead of the forthcoming elections and not in respect of the Ogoni cleanup eercise. Nsuke spoke in Bori while addressing Ogoni youths at te MOSOP secretariat. 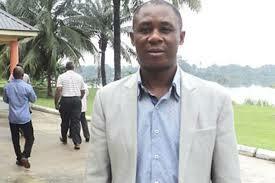 The MOSOP president, said there was no justification to contemplate military deployment to Ogoniland. Nsuke maintained that the UNEP report on the Ogoni environment and the cleanup exercise have been embraced by the Ogoni people. The only areas of disagreement had been HYPREP's (Hydro Carbon Pollution Remediation Project) attempt to shortchange the interest of the Ogoni people. He said there are other multinationals working around Ogoni and none of them have demanded soldiers questioning what is so special about a cleanup program that only soldiers can secure. The MOSOP president warned that the Ogoni people will resist the deployment of soldiers by all means possible and legitimate including massive protests against soldiers. He reminded the youths that the last time soldiers were deployed ahead of the 2016 rerun elections, an estimated 46 persons were killed. When they launched the operation crocodile smile, several people were harassed and brutalized. Soldiers only ill and torture us and we do not want them, he said..
"The only memory we hold strongly of Nigerian soldiers is that they have killed thousands of Ogonis especially the Shell-backed killings of the 90s. We simply do not want them in Ogoniland and we now that it is our right to reject soldiers' deployment to Ogoniland as an indigenous community. Nsuke said "the implementation had been over delayed and the only excuse the government gave for the delays was adequate preparations. This has turned out be award of contracts rather than implementing the report which listed water provision as an issue to be treated as an emergency"
The president of MOSOP said HYPREP was being mischievous. He accused HYPREP of creating an unnecessary tension to justify the deployment of soldiers to Ogoniland and get their political contractors to loot Ogoni cleanup funds ahead of the elections. "What I see is that HYPREP is trying to agitate the people, create unnecessary tension by not doing the right thing and use that to deploy soldiers into Ogoniland as election approaches" he said.